Sen. Susan Collins answers reporters' questions after speaking on the Senate floor, on Capitol Hill, Friday, Oct. 5, 2018, in Washington about her vote on Supreme Court nominee Judge Brett Kavanaugh. After she delivered a pivotal vote that helped seat Brett Kavanaugh on the Supreme Court, Maine Sen. Susan Collins had the best fundraising quarter of her career, shattering her previous best with the help of a flood of out-of-state money. After announcing her decision to vote in favor of Kavanaugh’s controversial nomination during a speech on the Senate floor in early October, Collins raised $1.8 million in the final quarter of 2018, according to documents filed with the Federal Election Commission on Wednesday. Of the nearly $900,000 she received from individual donors who contributed more than $200 to her campaign, just $19,000 was from individuals with Maine addresses. Abbott added that the campaign received “many contributions” from Maine that were under the $200 reporting threshold. From the beginning of 2017 to the end of 2018, Collins, a Republican, raised $2.9 million. More than 60 percent of that total was raised in the fourth quarter of 2018, when she brought in an average of roughly $20,000 a day. Collins’ previous best fundraising mark was set in the second quarter of 2007, when she raised $1.2 million. Collins has raised more than $1 million in a quarter five times in her 22-year career. But this is the first time she surpassed the $1 million mark outside of an election cycle in which she was running for office. In the quarter before her Kavanaugh vote, she raised just $140,000. While donors do not disclose the reason for their donations, Collins’ decision to back Kavanaugh was widely regarded as one of the most consequential of her career and earned praise from conservatives. A Morning Consult poll showed that her approval rating among Republicans jumped 46 points between the third and fourth quarter of 2018. That same poll showed her overall approval rating remained steady. The Senate confirmed Kavanaugh to the Supreme Court on a 50-48 vote, one of the narrowest margins in U.S. history. Collins and Sen. Joe Manchin, D-West Virginia, cast the decisive final votes for Kavanaugh, who Christine Blasey Ford said sexually assaulted her when they were teenagers. “Therefore, I do not believe that these charges can fairly prevent Judge Kavanaugh from serving on the Court,” Collins said. As she described why she was voting to confirm Kavanaugh during the October speech, the page for the fundraiser crashed. It eventually raised $3.7 million. “It’s very clear a majority of Mainers did not agree with that decision and haven’t forgotten it,” said Amy Halsted, co-director of the Maine People’s Alliance, a left-leaning activist group. The Alliance was one of three groups that launched the crowdfunding effort. 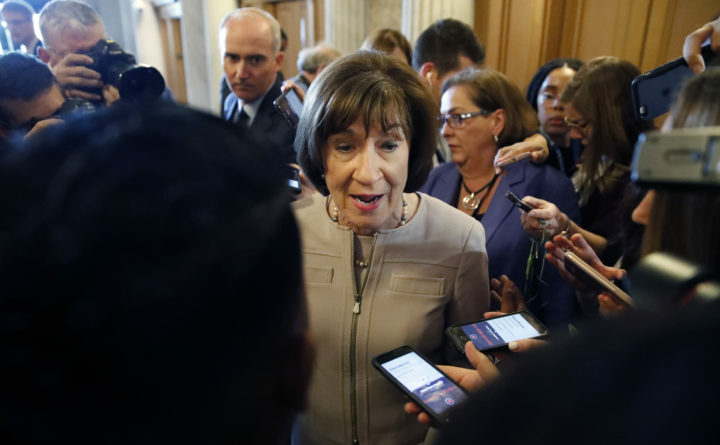 Collins, a moderate who helped defeat her party’s health care reform efforts in 2017, has enjoyed wide margins of victory in recent elections. No Democrat has yet announced an intention to run for Collins’ seat in 2020, although Maine Speaker of the House Sara Gideon, D-Freeport, and former National Security Adviser Susan Rice have been named as possible challengers. Collins easily won her last election in 2014, securing 67 percent of the vote.